When we last heard from Harry, he was singing “Puttin’ on the Ritz“, and I promised to post his radio theme, I Love a Parade”. Thanksgiving Day being the occasion for one of the grandest parades of the year, it seems like a fitting choice. Columbia 2701-D was recorded August 15, 1932 in New York City by Harry Richman and issued with their short-lived “Radio Record” label, which seemed to have often featured more than just straight song singing, in a more “radio-like” performance (some of Rudy Vallée’s have announcements at the beginning, and you’ll hear what this one’s like). 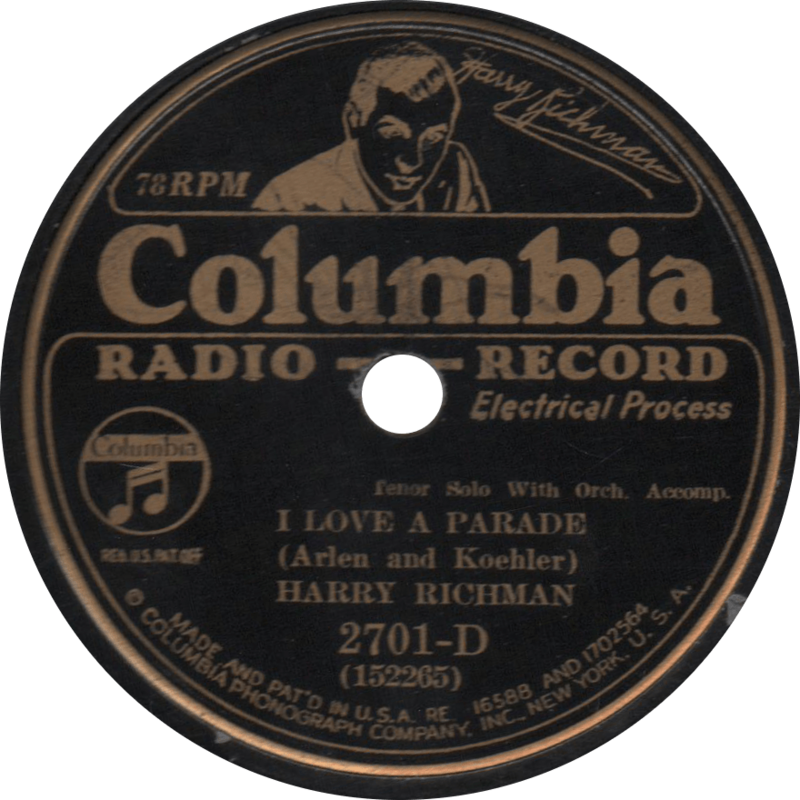 First, Richman delivers an (a bit more than) exuberant rendition of what was later the theme song of his radio show in the 1930s, Ted Koehler and Harold Arlen’s “I Love a Parade”. I Love a Parade, recorded August 15, 1932 by Harry Richman. 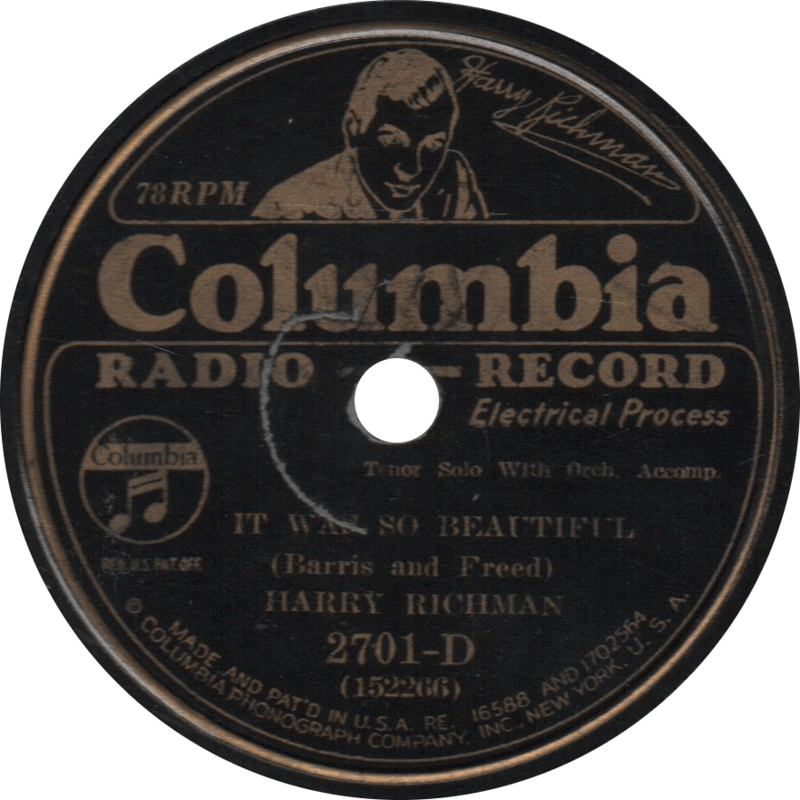 Next, Richman sings the popular Arthur Freed and Harry Barris (whose birthday was just a few days before this posting) composition “It Was So Beautiful”. It Was So Beautiful, recorded August 15, 1932 by Harry Richman. This entry was posted in Records and tagged 1930s, 1932, Arthur Freed, Columbia, Harold Arlen, Harry Barris, Harry Richman, New York, Popular, Ted Koehler, Vaudeville by R. Connor Montgomery. Bookmark the permalink.